May 14 , by Katrina. As I mentioned last week, The San Francisco Bead and Design Show will be taking place from May 21-23, 2010 (for more information about the show itself please see below). In the previous post about the show we had a mini-interview with Carole Witt of String Bead. This week’s mini-interview is with Genevieve Church from Loot! KM – How did you start working with recycled glass? GC – After lampworking “virgin” glass for 10 years and becoming increasingly dissatisfied with the waste I saw in the glass world, one day I had a “eureka!”moment when looking at the pieces of a friend’s broken blown glass art. I thought, “It’s still so beautiful, too bad it has to be thrown out.” The light bulb went on for me. I began experimenting with the fragments of that piece. KM – Some artists believe that the material reveals the artwork within, with that in mind, do you search for glass with a specific design in mind, or do you feel that a specific piece of glass leads you to the final design? GC – The final design of my work is determined by the color and thickness of the original blown glass piece and by the pattern of breakage, both in the original “accident” and as I use tools to break it further into useable sizes. I love working with material that already has a personality. KM – What is your major source of inspiration, music, a specific jewelry style, another art form, nature, etc.? GC – Saving these gorgeous pieces of glass from the landfill! I love the fact that I am recycling a type of glass which can only be recycled through reuse and that I am keeping the beautiful colors of my friends hard work in the public eye. Both aspects are constant motivation. KM – What piece or technique are you most proud of having mastered? GC – There are many different types of glass. The type I am recycling is ideal for glassblowing but is typically thought of as being very difficult tolampwork, which is how I work. (Melting and forming solid glass over a torch instead of working with molten glass from a furnace). I am very proud of having experimented my way to a very different set of methods than I used to use in order to tame these pieces and work with them. KM – What resource, classes, books, videos etc, would you suggest to our readers as a way to get started doing lampwork of their own? GC- I suggest taking an assortment of lampworking classes with as many different instructors as possible. Learning a variety of individual methods will help you find your working style and advance more quickly. I think hands-on study is the most efficient way to learn. If you are interested in contacting Genevieve, you can find her website above or visit her at the show. Her booth number will be B125. 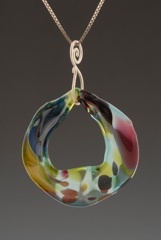 San Francisco Bead and Design Show, May 21 – 23, at Hotel Whitcomb, 1231 Market Street, San Francisco. 10-6, Fri-Sun, open to the public. More than 150 artists and merchants showcasing: handmade, antique, vintage and contemporary beads, gemstones, designer components, vintage findings, gold & silver, handmade jewelry, cloisonné, ceramics, wearable art, embellishments, textiles, hand dyed ribbons, art clothing, hand painted silks, millinery, embroideries, accessories, collectibles, antiquities, and objets d’art. Along with workshops in jewelry, clay, mixed media and bead making. For more information visit, sfbeadanddesignshow.com. We had a winner of last week’s giveaway for a ticket to the show and pass for a class with Carole Witt. If you would like a chance to win the other ticket and pass, just comment here. Feel free to add additional comments if you link to this post on Facebook, Twitter or your own blog. A winner will be chosen at random.